Over more than 10 years spent helping millions of English learners around the world become fluent speakers, we’ve continually encountered the same questions and concerns. English learners everywhere struggle with their pronunciation, and often can’t understand casual, spoken English. They worry about using the wrong words or grammar in conversations. They want to know how they can speak English fluently, without hesitation or fear. Those who read this guide – and put its principles into practice – will receive something so priceless that it cannot be measured in terms of money. They will gain the ability to express themselves in spoken English freely and easily, marking them as people to be respected and listened to socially and professionally. They will also develop a powerful self-confidence that can never be erased, and enjoy the opportunities, advantages and rewards that accompany fluency for the rest of their lives. 2. Learn like natives. Most students learn English though their native language. This is why they often have to translate in their heads before speaking. To understand native English speakers and speak automatically, start by consuming native English content that’s appropriate for your ability level. This could be something as basic as a book or TV program for children. Choose something you already understand at least 80-90% of so that new information can be absorbed by your brain easily. Review this content until you can use it in conversations without hesitation. Then, as your understanding and confidence grow, move on to more challenging material. 3. Divide and conquer. Here’s the simple formula for rapid fluency (borrowed from Tim Ferriss, the patron saint of learning): 1. Divide the native English content you want to learn into easy-to-understand pieces. These could be things like the vocabulary words or grammar points found in a song. 2. Select the most important 20% of information to focus on that will give you 80% of your results. There may be 10 new words you could learn in a particular song, but two of them will appear in conversations far more often than the other eight. 3. Order the pieces of information you’ve selected from basic to complex and begin learning. 4. Culture is essential. A language is more than nouns, verbs and adjectives. If you do not also understand a community’s myths, pop culture references, stories and jokes, you will miss much of what’s being said. Double the speed at which you get fluent by learning language with culture. Master grammar through cooking shows. Build your vocabulary while fixing cars. Improve your pronunciation as you enjoy plays, musicals and operas. 5. Study words together. Phrases – and not words – are the real units of fluency. When you learn phrases, you discover how ideas connect and the sounds of words blend together. 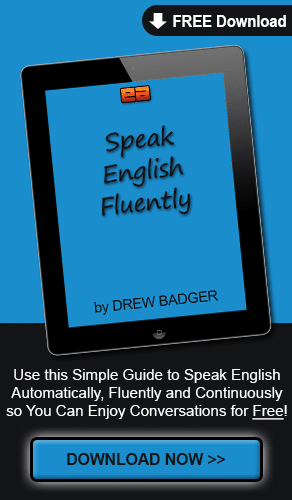 This trains you to understand the fast speech of native English speakers, and helps you to improve your pronunciation. Groups of words also form stories that are easier for you to visualize and remember. 6. Use video. Even though videos require far more time and energy to produce than text or audio lessons, we create them because they help you learn more effectively. Studies show that words by themselves only communicate 7% of what we want to express. 38% of the meaning expressed in a normal conversation comes from pitch and intonation. The visual language cues of a language add another 55% to understanding. Videos give you the total picture of a language’s words, sounds and actions. They also significantly increase your ability to remember what you study. 7. Limit scope. Millions of English learners know lots of words and expressions but can’t use them competently in conversations. This is often a consequence of studying too much and mastering too little. Fluency is measured by what you can use, not what you know. So why not learn to use a few things really well and build upon that foundation? 8. Connect. Fluency is cultivated in the real world, so connect with native speakers and start practicing. To find them – and they’re everywhere – forget about the English and look for online forums, groups and communities of native English speakers who share your interests. Focus on the activities you enjoy and you will create lasting friendships with native speakers naturally. 9. Stretch yourself. Just because you hear the same questions in conversations repeatedly doesn’t mean you have to give the same answers. Every time you’re asked what you do or where you’re from, reveal a bit more about yourself. Are you from New York, or the Upper East Side of New York? Do you race sailboats, or fractional rig sloop sailboats? 10. Keep building. Persistence is the one trait shared by all students who get fluent. Keep moving towards your goals – even if you only have 5 minutes a day – and you will surely find success! It is impossible, in this brief guide, to reveal more than a hint of what we know – and how we can help you become a successful English speaker. 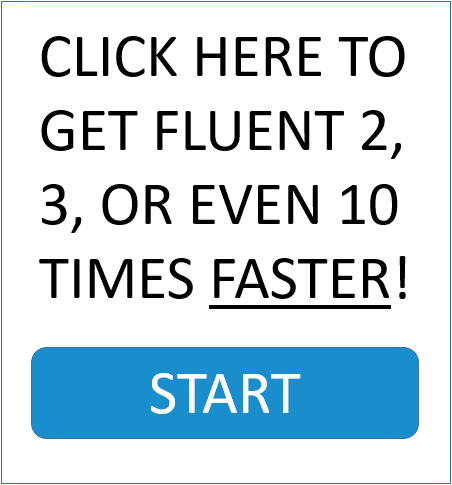 So we’ve created a simple quiz you can use to discover your biggest English fluency frustration so you can get fluent 2, 3 or even 10 times faster. In this new video training, we’ll reveal simple, proven techniques you can begin using immediately to improve your accent, understand native speakers, learn vocabulary, master grammar and much more. Click here to take the quiz, and start becoming a more confident English speaker TODAY!